Remember the Barcelona-based photographer Yago Partal, who created a funny photo series called 'Zoo Animals'? Yep, the one where animals were dressed like humans. Well, he's expanded his series to include baby animals too! 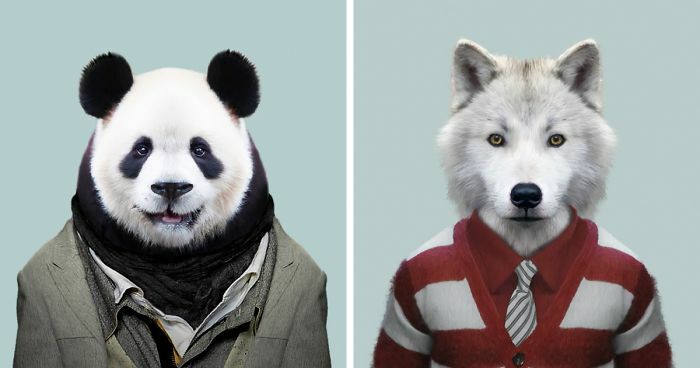 The photos in the series reveal the animals' other side with the clothes they're wearing, plus each picture is accompanied by a detailed description of the animal. From a white lamb wearing a chef's uniform to a Kodiak bear wearing a leather jacket to a white-tailed deer wearing a warm winter sweater - expect to see it all. But beware - this is an absolute cuteness overload! Very serious because of an important business meeting. Photo of Rocket Raccoon when he settled down. With the sea otter pup look like the McKenzie Brothers, eh! Just don't ask him to serve squab. The rare red neck lion. Did he make his own sweater? Ok These pictures have got to be photo shopped. How do you get a dolphin out of water, and into clothes much less smiling while doing it? HuH? HuH? What the hell? I WORK with some of these! Oh no zootopia will exist!!! I want to wear a person hat. Does the dog have a bird shirt?